Cosmos as sandcastle metaphor picture. This picture shows the whole universe (cosmos) represented as a sand castle on a beach. Notice that the tide is coming in, with water already getting close to the sand castle. 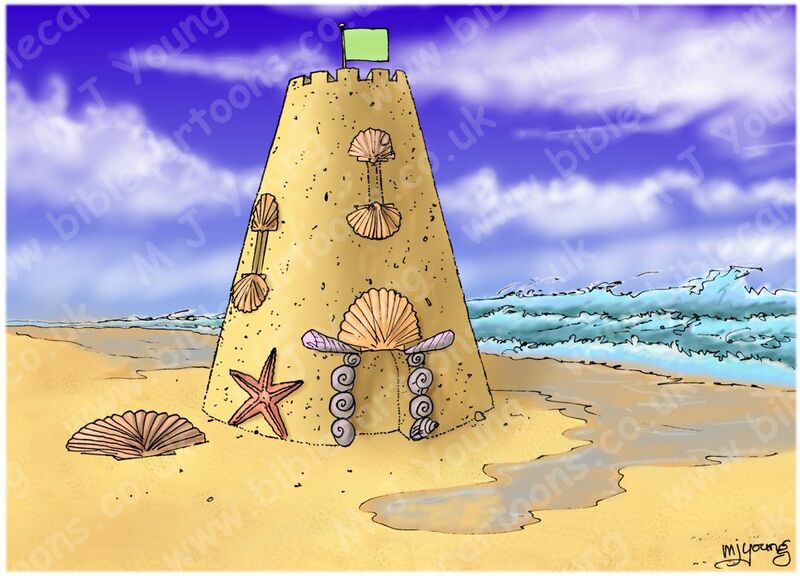 The tide represents the approaching end of the cosmos, as promised by the return of Jesus in the Holy Bible. Many people view our physical life here on earth as being all that there is. The Christian view is quite different; life here is finite (typically spanning 70-80 years), but there is an eternity after we die physically, where we enjoy life with God (for believers in God) or an eternity separated from God (ie in Hell) for those who have rejected God during their earthly life. I found myself thinking that for those people who believe the physical world is all that there is, they will be pretty shocked when the cosmos comes to an abrupt end, and they are presented with the existence of God and His judgement. It is very easy for us to focus exclusively on the world, in terms of our education, job, career, family, interest, etc, but to miss the really BIG picture, that our world will come to an end, Jesus WILL return, as promised, and all that the Bible portrays will eventually come to pass. 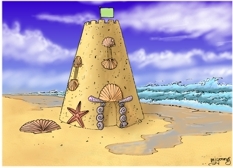 …but, if the sandcastle in the metaphor picture above represents the whole universe, and the tide is coming in, then what will those people think when the cosmos is swept away on the final day of God’s judgement? All that work and effort to unlock the secrets of the universe will have gone down the drain, along with the cosmos! Whilst it is good to study the cosmos, it is better to keep an eye on the tide! A Christian scientist has the best of both worlds, he or she can enjoy the study of the cosmos and enjoy a personal relationship with its creator. When the inevitable end of the cosmos comes, the Christian scientist can pack up their tools and get on with worshipping the creator. It is not so easy for the unbelieving scientist; what will he or she do when the cosmos comes to an end, and there isn’t any call for scientific study any more? If a person rejects God in their physical earthly life, then I expect He will honour their choice in the eternal life that is to follow: He will allow them to depart from His presence for all eternity… a state we call Hell. Sermon/teaching theme suggestions: This picture could be used to talk about eternity, the universe, time and the end of time. It provides a picture of what happens when time ends, as God judges the world.